Nakamura uncorks brilliancy… now #2 on Live List! Aside from the “damp squib” that the Aronian-Carlsen turned out to be, the Nakamura-So was in striking contrast. Two members of the U.S. elite facing off and certainly Hikaru Nakamura is working hard to show that he is still the #1 player. After Wesley So’s brief resurgence to the top 10, he had been having a rough tournament. 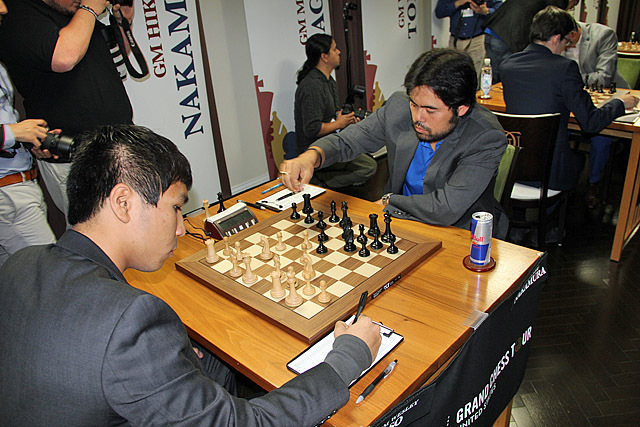 With his ubiquitous Red Bull drink nearby, Nakamura plays Ne7 in what became a game to remember! Photo by Daaim Shabazz. In this King’s Indian Defense, So started off blitzing the first 20 moves and seemed very confident in his preparation. In fact, after white’s 15.Rc1, the engines gave white a +1.60 evaluation. After the game, Nakamura cautioned against these types of assessments and showed why. Nakamura unleashes attack with 24…h4 and So panicked after 25.fxe4 f3! 26.gxf3 Nxe4! In this type of game it is white queenside initiative versus black’s kingside attack on the king. Which would get there first? As both executed campaigns on the wings, So seemed to be uncertain as to what to do on the queenside, but Nakamura certainly knew what to do! After 24…h4 it appeared that the black pawns were coming like “Space Invaders” and white needed to counter quickly. So took the bait with 25.fxe4 f3! 26.gxf3 Nxe4! and after thinking a half hour, So played 27.Rd1. There was no other move as 27.fxe4 lost in a raft of beautiful variations similar to what happened in the game. There was however a chance that Nakamura would overreach. Would the handsome gazelle get away from the ferocious lion? However, after a 30-minute think, white could not stave off the black onslaught after 27.Rd1 Rxf3! 28.Rxd7 Rf1+ 29.Kg2. The beginning of the end was Nakamura’s 29…Be3! but there was the stunning alternate sequence 29…h3+ 30.Kxh3 Rf2!! when 31.Bxf2 Qxf2 32.Nxf2 Nf4+ 33.Kh4 Bg5#(!!) In the post-game press conference, Nakamura was shown the variation and seemed humorously disappointed that he missed a chance at such a fantasy ending. Nevertheless, the game ended in a picturesque way with So showing enough class to allow checkmate on the board. While the Nakamura brilliancy sent the fans buzzing, there were other games that were thrilling as well. The Frenchman Maxime Vachier-Lagrave rose to the challenge of the Berlin Wall and played in very fine style. One would wonder that after all the theory that has been seen in this line, how a player of Veselin Topalov’s caliber could fall in such dire straits. The key moment came after MVL played 18.e6! which was designed to destroy black’s structure and exploit the grip on the dark squares. Fast forward to 33.f5! black played 33…Nf8 when the counter-intuitive 33…Nh8 may have been a bit better. White ended up raided the black kingside pawns and ended up with an armada of his own pawns. 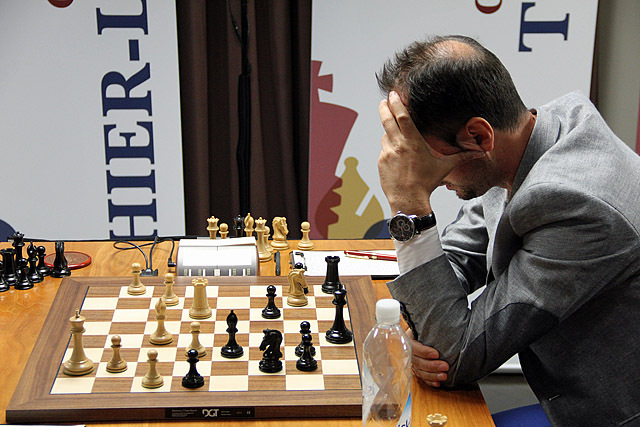 Topalov resigned and has now lost two in a row after leading the tournament in the first half. What has happened to Veselin Topalov? This was the round where pawns earned their paychecks. Look at this bold display by Caruana! However, Grischuk had an answer. 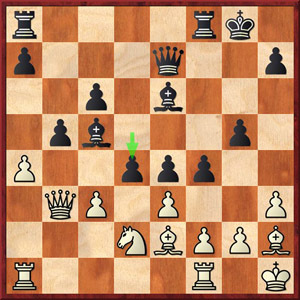 Grischuk-Caruana game had its share of twists and turns… and another …g5 move! Caruana played an aggressive pawn game and sacrificed a piece (15…Nxc5) for strong initiative. 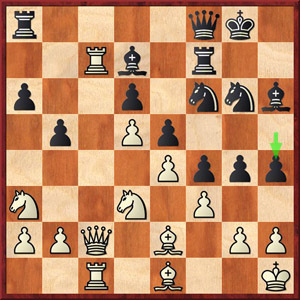 However, at a critical moment he did not play the most daring continuation (17…fxe3!) and allowed the Russian a chance to hold the position together and simply pocketed the piece. While Caruana managed play with his two connected passed pawns, they ended up getting blockaded and his exposed king eventually came under fierce assault and after 40.Qa1 black would have been mated. Ironically, Caruana failed to make his 40th move and forfeited. Grischuk had been the one battling zeitnot this tournament. This is deja vu for Caruana who lost a heart-breaking game to Carlsen in a time scramble. 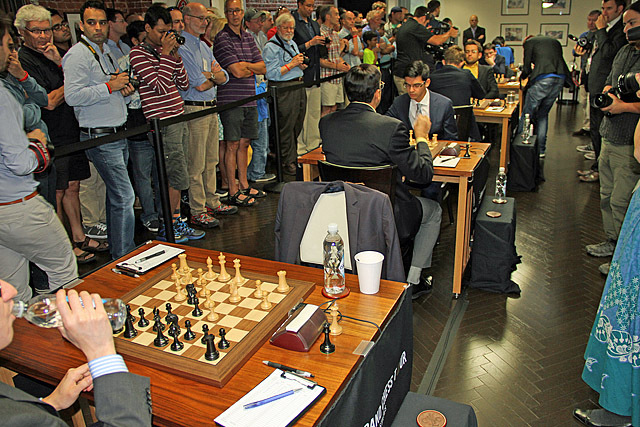 Anish Giri set forth to face Viswanathan Anand in front of the throng of fans. Photo by Daaim Shabazz. The Anand-Giri game had no such roller coaster and the game was level throughout. Giri spoke to chess.com about his recent improvement since his rough patch a few years back. He credits his improved play to being a better defender and is now at #5 on the Live Rating List and at 2798.5 may eclipse 2800 for the first time. Viswanathan Anand has not had an ideal tournament but has certainly had a loyal base of fans cheering him on. He looks to get his first win in round seven against a beleaguered Wesley So. 1st-2nd: Magnus Carlsen, Levon Aronian, 4; 3rd-5th: Anish Giri, Maxime Vachier-Lagrave, Hikaru Nakamura, 3½; 6th-7th: Veselin Topalov, Alexander Grischuk, 3; 8th-9th: Viswanathan Anand, Fabiano Caruana, 2; 10th: Wesley So, 1½. Video by Spectrum Studios (for CCSCSL). Trivia: This round there were three types of results… by checkmate, by time forfeit, by resigning. It is rare to have this to happen in the same round.